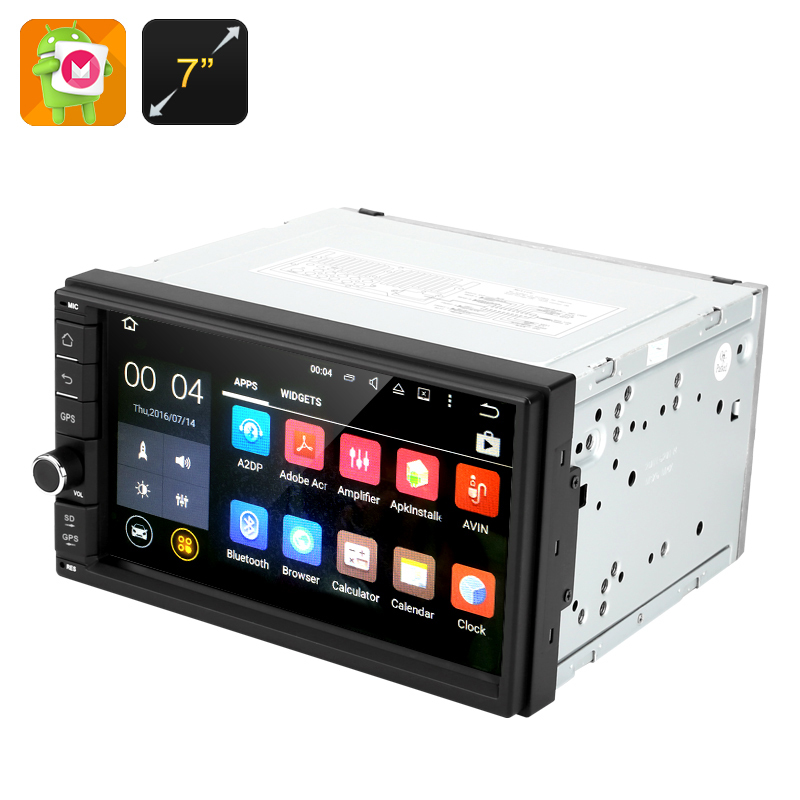 Successfully Added Android 6.0.1 Car Stereo - 2 DIN, 7 Inch Touch Screen, Bluetooth, GPS, Radio, Universal Fitting, 4x 45 Watt Output to your Shopping Cart. Stay entertained on any road trip, no matter how long, with the Android 6.0.1 Car Stereo. Perfect for lengthy car trips and a great way to entertain those in the back seat, the 2 DIN Stereo comes with intuitive Android 6.0.1 interface, a responsive 7-inch touchscreen, GPS and more. We all know how these long car rides go. You may start off excited about your fun destination but somewhere along the way, everyone starts getting bored. And that means trouble — people will start asking for stops, give you driving advice, etc — you catch the drift. What can you do to occupy the backseat drivers on the road? This Android car stereo player has all the answers. You can watch all your favorite movies on the 7 inch 1024x600 TFT LCD screen in great quality and without bulking up your vehicle. With Bluetooth support, you can hook up a pair of external wireless speakers, headphones and more. Pair the Stereo with your smartphone and use it to hold calls hands free: dial, hang up, send messages and more. Sporting the upgraded Android 6.0.1 interface, the 2 DIN Stereo offers easy navigation. With GPS support, you can use the 7-inch display for finding your way around town, you can use voice commands to locate the nearest rest stops and even plot your route. The Android 6.0.1 Car Stereo comes with a 12 months warranty, brought to you by the leader in electronic devices as well as wholesale Car Stereos.. This model is compatible with most brands of GPS software ­ however hardware specific software such as Garmin may not run on this unit. As the wholesaler, we provide the GPS­ enabled hardware only, not the software. We provide no warranty or customer support regarding GPS software. We cannot provide downloads, links, advice regarding GPS software. Any software installation you undertake should be performed or supervised by a professional. This arrived well packed a day or so earlier than promised. It was replacing a WindowsCE unit I bought from Chinavasion back in 2010 and installed in my 4WD which I use off-road a lot. That shakes things up. I had the bad luck to need a warranty replacement back in 2010 and Chinavasion handled the problem really well. Seven years later that unit finally died near the end of a 1100 km trip across the rough dirt Tanami desert road. This replacement head unit is a huge improvement. It installed easily, plug and play apart from a minor point below. Radio sounds good, Bluetooth works great, Screen is bright and clear and responsive to touch. WiFi connects to my home from the driveway to install software OK. I have installed Android Auto as well as the supplied Google maps (I use phone hotspot for internet connection) also Here maps which works offline. I have also installed OziExplorer and Hema Explorer for off-road navigation. Best of all is that the reverse camera now turns on within a second or so. The old one was slow and cost me a back door when I was in too much of a hurry to wait for it. Only small hiccup to the install was the antenna control line. improvement I would suggest is to run that to the ISO plug instead of leaving it as a bare wire.